OXFORD, Miss. (AP) – The FBI has identified a Mississippi man suspected of mailing letters containing poisonous ricin as 45-year-old Paul Kevin Curtis. FBI Special Agent in Charge Daniel McMullen said Curtis was arrested Wednesday afternoon at his apartment in Corinth, near the Tennessee state line about 100 miles east of Memphis. Authorities still waited for definitive tests on the letters sent to President Barack Obama and Sen. Roger Wicker, R-Miss. An FBI intelligence bulletin obtained by The Associated Press said those two letters were postmarked Memphis, Tenn.
A Mississippi man was arrested Wednesday, accused of sending letters to President Barack Obama and a senator that tested positive for the poisonous ricin and set the nation’s capital on edge a day after the Boston Marathon bombings. FBI Special Agent in Charge Daniel McMullen said the man was arrested Wednesday. His name wasn’t immediately released publicly. Authorities still waited for definitive tests on the letters to Obama and Sen. Roger Wicker, R-Miss. An FBI intelligence bulletin obtained by The Associated Press said those two letters were postmarked Memphis, Tenn. The letters were intercepted before reaching the White House or Senate. The FBI said Wednesday that more testing was underway. 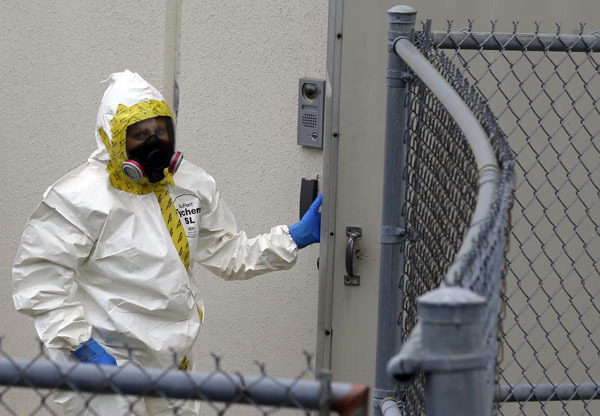 Preliminary field tests can often show false positives for ricin. As authorities scurried to investigate three questionable packages discovered in Senate office buildings, reports of suspicious items also came in from at least three senators’ offices in their home states. Sen. Jeff Flake, R-Ariz., said suspicious letters at his Phoenix office had been cleared with nothing dangerous found. A package at Sen. John Cornyn’s Dallas-area office also was declared harmless, a fire department spokesman said. All three packages in the Capitol complex turned out to be safe, Capitol police spokeswoman Makema Turner said late Wednesday. But a man was still being questioned after being stopped in connection with the packages, she said. All the activity came as tensions were high in Washington and across the country following Monday’s bombings at the Boston Marathon that killed three people and injured more than 170. The FBI said there was no indication of a connection between the letters and the bombing. The letters to Obama and Wicker were postmarked April 8, before the marathon. Capitol Police swiftly ramped up security, and lawmakers and staff were cautioned away from some parts of the Hill complex. After hours of jangled nerves, officials signaled it was safe to move throughout the area and people settled back to normal, if watchful, activity. Sen. Claire McCaskill, D-Mo., said that police had a suspect in mind in the Wicker mailing, someone who “writes a lot of letters to members.” She made the comment Tuesday as she emerged from a briefing by law enforcement on the Boston bombing. Authorities declined to comment on a possible suspect. Obama’s press secretary, Jay Carney, said mail sent to the White House is screened at a remote site for the safety of the recipients and the general public. He declined to comment on the significance of the preliminary ricin result, referring questions to the FBI. After the hearing, Donahoe said he didn’t know whether the latest letters had been proven to contain ricin. He also told reporters that people sometimes mail substances that mimic the poison. No postal workers have reported illness connected to the incident, he said. Ricin, derived from the castor plant, is at its deadliest when inhaled. Even during the flurry of concern, normal business continued across most of the Capitol and its office buildings, with tour groups passing through and visitors streaming in and out of Wicker’s office. Senate Sergeant-at-Arms Terrance Gainer said in an email that suspicious packages were dropped off at the offices of two senators. Sen. Richard Shelby, R-Ala., said in a statement his office had received one of them. A third package was found in an atrium on the first floor of a Senate building. As the discoveries spread concern, police sealed off a hearing room where Defense Secretary Chuck Hagel and Gen. Martin Dempsey, the chairman of the Joint Chiefs of Staff, were testifying. At one point, officers advised Sen. Joe Manchin and aides not to board an elevator because suspicious packages had been found on several floors of the Hart Office Building. “They just told me there’s something suspicious and they’re looking into it,” Manchin said. Amy Keough of Stow, Mass., and her family were searching for an open entrance to the Russell Senate Office building and walked by a U.S. Capitol Police hazardous materials vehicle. The Keoughs had been visiting Washington for several days, but Monday’s marathon bombing was on their minds.